Tailor~Made™ Deluxe Bell style Softback Shades are made of Tissue Shantung material with self double fold trim top & bottom. The beige color shades are lined in off-white satin material and have sturdy brass plated shade fitters that are recessed 1/2". Our Tailor~Made Lampshades™ are of the finest quality available and come with a guarantee of your satisfaction. All sizes are in inches. - If you require an opal reflector shade to hold a floor lamp-size shade, see our selection of I.E.S. opal glass reflectors). Learn how to choose the correct size fabric shade for your lamp! 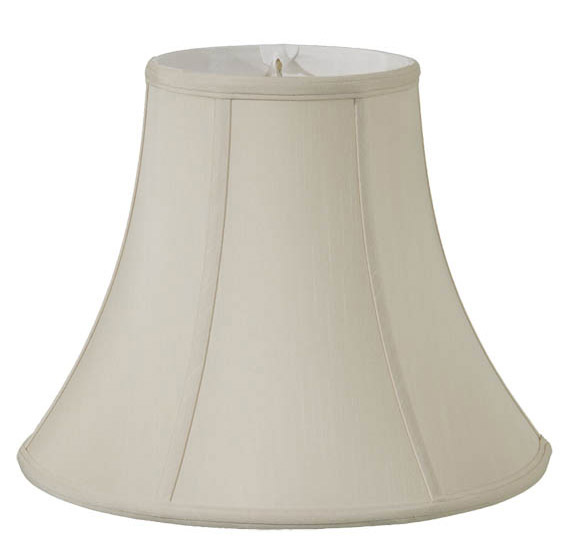 No reviews yet for the Beige Color Deluxe Bell Lamp Shades.